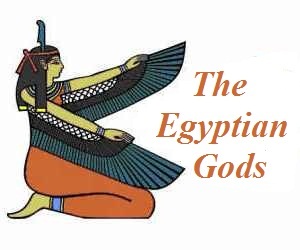 Discover the legends and myths and religious beliefs surrounding Aah, the ancient Egyptian moon god and time who was linked to other lunar deities such as Khonsu and Thoth. Aah was also associated with Osiris. The word "A'ah" is the Ancient Egyptian word for the moon. Aah was depicted as a human wearing a tight fitting garment and a headdress or crown made of a a crescent moon with a sun disk on top. 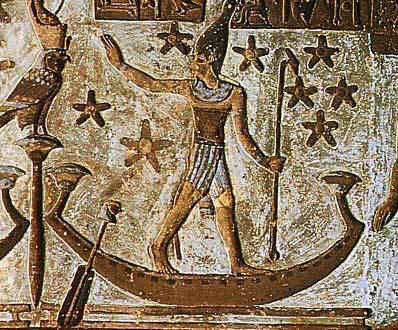 He is also depicted wearing a long tripartite wig with the Atef crown topped by a moon disk. Aah is credited for having created the original Egyptian calendar as Aah Tehuti which was the name of Thoth when he was represented as a moon-god. Aah was the Egyptian god of the moon and time. He was represented as a young god and the student of Thoth. He is therefore regarded as a Patron of pupils and students. Translation of Hieroglyphics for Aah: The first symbol is a reed for the letter 'J', the arm is a symbol for the small letter 'a', the wick represents the letter 'H' and the last symbol represents the crescent moon. Aah was an ancient Egyptian moon god and time. He was also revered as a god of fertility. Aah was in charge of the ancient lunar year (12 to 13 months of 28 days each). The ancient Egyptians used the sun, moon, the planets, and the stars as a reference for measuring the passage of time and charted the heavenly skies to make some sort of sense out of their environment. The first ancient Egyptian calendar dates back to 4236 B.C.E. The changing phases of the moon were extremely important to the ancient Egyptians. The earliest Egyptian calendar was based on the cycles of the moon but it did not enable the Egyptians to predict the annual flooding of the Nile. Aah was also revered as a fertility god. The lunar calendar in Egypt was used by priests as a guide to improving the yield of agriculture crops on which much of ancient Egypt's wealth was based. The flooding of the Nile was of such importance that the Egyptians based their lives around it. Months were grouped into three, four-month, seasons. The Egyptian months were organized as twelve 30-day months, so there were 5 extra days. 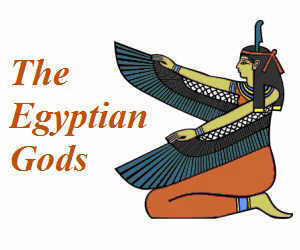 In an ancient Egyptian myth the goddess Nut had been cursed by Ra so that should could never give birth on any day of the year. Thoth played a dice game with Aah and won enough lunar light to make five extra days. Thoth inserted them into the month of July. These extra 5 days were not included in the curse of Ra so this allowed Nut to give birth to her five children, Osiris, Horus, Isis, Nephthys, and Set. The lunar calendar developed into the 365 day solar calendar when the ancient Egyptians began to notice the "Dog Star" Sirius rising next to the Sun every 365 days, marking the time when the Nile river also began its annual flood tide. Aah is credited for having created the original Egyptian calendar as Aah Tehuti which then developed from a moon to a sun calendar, which perhaps explains his headdress that consists of both the crescent moon and the sun disk.